Dr. Britany Matin’s maternity leave was a little unorthodox. While most new moms take at least six weeks off after having a baby, Dr. Matin was back to work two weeks after giving birth. It was admittedly quick, but the 32-year-old periodontist didn’t feel she had a choice. Dr. Matin opened her Auburn practice from scratch in 2015 and with few periodontists in her area, let alone the state of Alabama, there wasn’t anybody to cover her patients for an extended period of time. She didn’t want to leave her patients in the lurch, so she came back to work earlier than the average working mom might. Dr. Matin is among many dentist moms — and working mothers in general — who struggle with balancing their family and professional lives. And the balancing act started when she was pregnant. She was lucky not to have any complications that forced her to stop working, but it was something always on her mind. 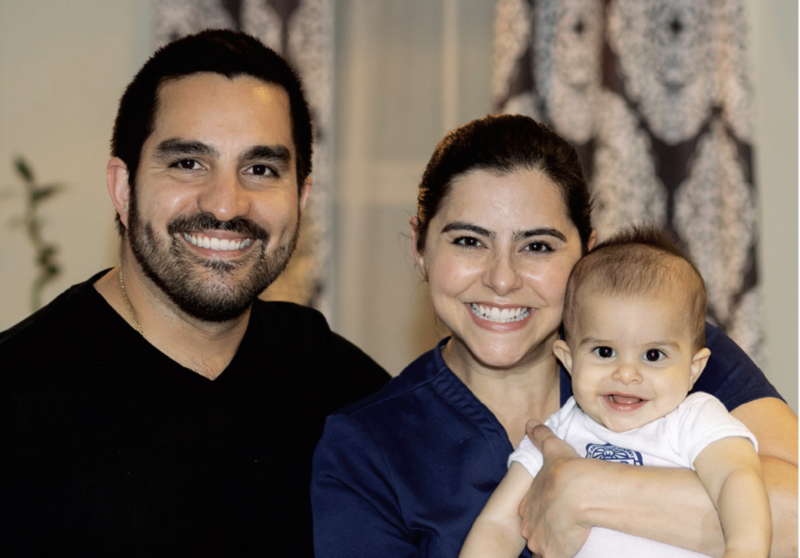 Dr. Matin worked up until a week before she delivered her son, Luke Armour Guzman, in early January; a busy time for most dental practices with patients rushing to use the remainder of their benefits for the year. Since she’s a solo practitioner, Dr. Matin closed her practice for two weeks after Luke was born. She allowed herself a shortened schedule the first four weeks back; working 10 a.m.-3 p.m. every day. Being up multiple times a night with Luke, she wanted her mornings free to get into a routine before going to work each day. Getting the hang of breastfeeding while at home and pumping at work was also a struggle, she said. But the hardest part, Dr. Matin said, was finding a babysitter to watch her son during the day while she worked. She ultimately turned to Care.com and was able to interview candidates. “That’s the hardest part: leaving your two-week-old with someone you don’t know,” Dr. Matin said. She’s also navigating a good portion of her days solo. Dr. Matin’s husband, Dr. Luis Guzman, a duel trained periodontist and prosthodontist, is finishing up dental school at the University of Alabama in Birmingham and drives two hours each way to school each day. Once he graduates in 2019, Dr. Guzman will join his wife’s practice. As if having a 9-month-old and a husband gone for most of the day isn’t enough, Dr. Matin is also opening up a second practice in Columbus, Georgia, about 30 minutes away from her current office. This one has a nursery. Despite the challenges of being tired and managing her family and her practice, Dr. Matin said she feels very fulfilled as a mother and a dentist. New opportunities in dentistry can give moms and dads that want a more flexible schedule to still work. I graduated in 1981 as a dentist and had amazingly similar experiences. My husband was still in dental school and I ran a solo practice–I went back to work 8 days after Rachel was born, but had the privilege of my mother being there for me. Not much has changed in 30 years!. As a grandmother of a 9 month old that I am taking care of, I try to arrange my consults and business calls around her schedule–not always easy. But, I tell my adult children, now, that they are the best thing that ever happened to me and they are worth every sleepless night! Good luck to all working dentists that are parents–you are in control of very little in life except your schedule at work–use that control to your advantage! Amazing story of courage & multi-tasking! This was me. My third child was born 11 years ago. I worked the day before she was born. I took off 2 weeks, then returned to a shortened work day for the first few weeks. I was back to my regular schedule 6 weeks after her birth. I am a solo practitioner in a general practice. My oldest was born in 1995, right before my last year of dental school. My second child was born as my AGD residency came to conclusion. I took off 6 weeks for each of my first two. But my situation was different then. When you are the only one, you NEED to return or the bills don’t get paid and the patients may leave. It is hard, but it can be done with planning and determination. I don’t regret any of my decisions as it relates to maternity leave. Consider taking your child to work. All three of my children spent 6 months in my office. My staff helped, I hired teenagers in work study and a new graduate. Even my patients rocked my children.we had an hour and 1/2 lunch during each 6 months. I did this in the ‘90s. Thanks for the shared experience. I am planning to go private and as a mother, my fear is to loose clients when i am expecting or when kids are sick. For my first two children I was an associate and took 6wks off. For my third I had vinyl soundproofing material installed on the walls of my personal office in my solo practice and hired a young lady to watch her there for three months. I had her on a Wednesday and was back to work on the following Monday. I kept my schedule light the first few weeks and had the hygienists on full schedule. It worked out really well for me bc we didn’t have to shut down the office and I was able to be with my baby daughter all day (no pumping!). I’m not planning to have a fourth but if I was I would do the same and maybe even stretch it to 6 months. When I decided to switch a careers and leave a demanding job in a large corporation to start dental school at the age of 28, I thought two things: 1) I may have trouble getting pregnant when I’m finally out of school and in a position to have a child and 2) at least dentistry is a wonderful profession for a working mom because of the flexibility it offers! HA! Twelve years later, stories like this seem like my personal hell. Two weeks?! Seeing 50-80 emotionally demanding patients and their parents a day in a physically demanding job on no sleep for weeks while your body is still recovering from major trauma? No thanks. Women right and left in dentistry work up until the day they give birth and are back in 2 weeks, 4 at the most (unless they don’t have much student debt and are very comfortable on their husband’s income or are not in ownership positions). Although there is no doubt women are tough as nails and *can* do this, the question is why endure this torture!? There must be an easier way. Until we figure out what it is, I have determined my best option is to avoid reproduction, I don’t really want a baby so much as to go through all that misery and years of being a zombie. Thanks for sharing! It is very difficult to balance personal life and business, especially as a first time parent. I am lucky that my wife is not a dentist, she’s a programmer, and she managed to get 6 months of maternity/disability through the State and her work. However, as a dentist in private practice, the idea of closing 2 weeks or more is unfathomable to me. It is very difficult to find a good dentist who can care for your patients as well as you do. It might make sense to work for a corporate dentist this if you are planning on having kid(s)until you are past this stage and then open up your practice. Regardless of how you decide to approach this dilemma, best of luck to you and be sure to plan in advance to avoid pitfalls should your pregnancy cause unforeseen complications. Really nice work you have done. For a dentist who is also a mother, it is not easy to balance their personal and professional life. There are a lot of things to be done in less time. Thanks for sharing your great experience with us. This will surely update people regarding what kind of challenges they have to face and how to deal with them properly. Thanks. In addition to being a great dedicated mother and running two practices, Dr. Matin still finds time to be a volunteer faculty member at the Advanced training program of the University of Alabama at Birmingham, school of Dentistry. She is a superstar! Wow! I have been a solo periodontal practice owner for 30 years and had the same experience–I worked full time up until I had my first child in 1996 at midnight (after 22 hours in labor) and was on the phone calling patients back at 8 am the next morning to ask “Can this wait 2 weeks?” Some patients were more understanding than others at that time, so yes, I returned to work full time after 2 weeks off. I had no family to help, and had to hire a live-in nanny, which was the only way for me to help juggle a full time practice and a newborn. I had my second child early December ’98 and took 4 weeks off due to the holidays…Which was a tiny bit easier, but you have to weigh all the options and what’s best you your family and the practice. I am sooooooo happy that the public is so much more understanding and less judgemental now about our options. YOU CAN DO IT!!! Thank you for sharing and congratulations to ALL the woman who have the determination to pursue their dreams! An amazing story of courage & multi-tasking! It is really a great blog post to read and I found some interesting tips for motherhood. So thanks for sharing it with us.